I recently had the opportunity to be in Washington D.C. for the American Chemical Society meeting, so I, of course, brought along my running shoes. 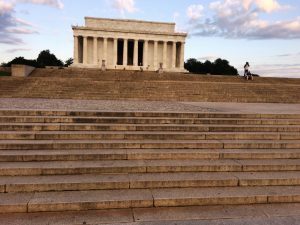 Now, Washington D.C. in August isn’t on most peoples’ list of favorite running destinations – let’s face it, it is kind of obvious why most politicians leave town this time of year. That said, it was indeed and 80/80 morning (80 degrees, 80 percent humidity), even as early as 7 am when I set out for a Saturday morning run on my first full day in town. I was staying at a hotel, just a few blocks away from The White House, which was unoccupied at the time, so I decided to run through the park in MacPherson Square until I reached the sometimes home of our CEO-in-chief. There is usually a crowd of tourists and protesters in front of this famous landmark, and even, of late, the recently famous “Trump Chicken“, but this early in the morning, there was only a poultry, I mean paltry smattering of runners and early bird tourists. And it is always a cool sight – I mean it IS the freakin’ White House! One of the sad observations about some of our most treasured landmarks in our Capitol, apparent over the last decade’s visits, has been the increasingly large security perimeter around everything, as illustrated by this photo. 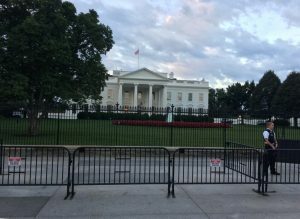 One can no longer go up to the wrought iron fence on Pennsylvania Avenue to get a picture lacking the obstruction – alas, our security needs now have an additional buffer zone, complete with conspicuously placed security guards. And don’t even think about getting anywhere near the South Lawn on the opposite side. Such are our times…..
After skirting the wide periphery around The White House, I next headed towards another famous landmark, the Washington Monument. By this point I realized that, other than security guards, the only folks outside were runners, and the homeless. 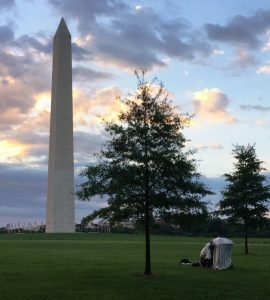 As I passed one particular vantage point on the obelisk, still closed for repairs, I couldn’t help but notice one particular homeless person asleep, alongside is shopping cart of belongings, but with a small American flag (hard to see from the photo) on top of it all. This seemed to me as an interesting summary of the state of our nation – our pride in our flag and our monuments, juxtaposed with poverty and wealth. At first, I hoped to get a little closer, but decided to set aside my visions of a more photojournalistic shot, and instead chose not to do anything to wake the fellow’s slumber. Turning the corner, I ran by the fountain at the end of the reflecting pools, erected to honor all 50 states and American territories. I was amused to note that one of the marble pillars had the name of The Phillipines inscribed – kind of a funny twist on the phrase “etched in stone”. Running alongside the reflecting pool, I quickly reached the Lincoln Memorial. This inspirational site is usually crawling with tourists, but at this hour, it was wonderfully quiet and uncrowded. It also provided the best hill climbing in central DC! From here, I returned to the Washington Monument on the other side of the reflecting pools, before returning to my hotel. It was a rather uncomfortable morning for running, but I decided to take a short side run into the nearby Embassy District, in search of one of my favorite DC monuments. 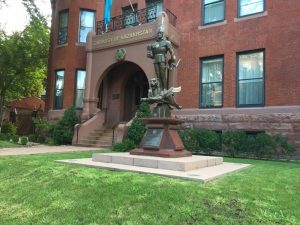 Wandering through this part of town when I was last in DC, 5 years ago, I stumbled upon one of the more curious statues, found in front of the Kazahkstan Embassy, and I was pleased that after only a few wrong turns, I was able to relocate it. After a quick online search, I found that this statue, known as “The Golden Warrior” is a smaller replica of a famous statue in Almaty, Kazahkstan. Legend has it that if you touch the original statue, only once, it will enrich your life of happiness and prosperity. Whew! On my previous discovery of this statue, I only touched it once, and this time, I neglected to do so, so I guess I am set! Finally, returning to my hotel room after an interesting and reflective 5.5 mile run, I cleaned up, and headed off to my chemical activities. 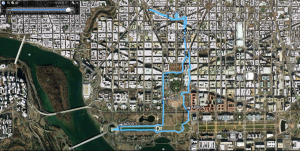 This entry was posted in Midd Blogosphere and tagged Kazahkstan, Running, Washington D.C. on August 25, 2017 by Jeff.